Mezzanine floors are widely accepted as a cost-effective way of increasing floor space, provided there is enough headroom within the building. As a general rule, a storage floor does not change the building's rateable value, whereas a floor for other uses sometimes does. 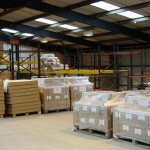 Mezzanine floors can be as small as 2 m x 2 m or larger than 60 m x 40 m, and up to 6+ m tall. They can be one, two or three tiers high, have standard or special staircases, lifts or access gates, handrails or partitioning barriers. They can use wood or steel decking, be finished in special colours, and can be totally encased, if desired. In fact, almost any conceivable option can be incorporated! There are no standard sizes of mezzanine, although the optimum grid size (distance between legs) is in multiples of 3.5 m x 4 m, with 2.4 m clear to the underside of the structure. 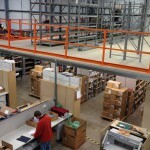 Every mezzanine we supply is designed to meet your individual site and usage requirements. Due to the almost infinite variety of heights, sizes, floor loadings and options available, the best course of action is to contact one of our specialist sales people and ask for a free no obligation site visit and quotation. The intended use of the floor dictates the loading requirement. In practice it is usually based on a minimum of 70 lbs per ft2 for general office space, 100 lbs per ft2 for light to medium storage, and 150 lbs per ft2 for heavy duty storage or wheeled traffic. However, if required, floors can be designed to accommodate much higher loadings. The clear span between the legs directly impacts the cost of the mezzanine and their distance apart is one of the most critical decisions to be made (the closer they are together, the smaller the steel sizes and the cheaper the cost). This depends largely on the type of work to be carried out below the floor. If you are building a storage area underneath, you generally have narrow aisles so the legs can be closer together and incorporated within the shelving systems. If you are forming offices, you can usually manage with 3-4 m and the legs can be incorporated into the partitioning. However, if you are using a forklift underneath, or making a production or assembly area, you may need 5-6 m between uprights. There are many rules and regulations that a mezzanine has to comply with but the most important ones are BRE Digest 437 which relates to structural stability, level of fire protection (depending on its type of use), travel distances in the event of need to escape and from the 1st May 2004 disability access has to be fully considered and allowed for (long and short term physically or visually impaired). 98% of all mezzanine floors require building regulation approval but very few will require planning permission (usually only if external building changes are also taking place or if there were restrictions imposed on the original building permissions). Our design teams will survey the area, prepare drawings and calculations, then submit them to our approved inspectors on your behalf and ensure the relevant approvals are obtained as quickly as possible. ESE has a wealth of experience in designing and constructing mezzanine floors in occupied buildings and we appreciate we cannot always have the luxury of a clear site. We will be in and out of your premises as quickly as possible and our Contracts team will liaise with yourselves as to the most appropriate method of working around you, always ensuring the Health and Safety of our fitters and your staff is paramount. You will need a plan of your site in relation to your neighbours, a plan of your existing premises, details of the make up of your buildings floor (thickness and grade of concrete etc) and details of any fire precautions and emergency lighting systems you already have in place. If you do not have these do not worry as we can obtain or create these for you as well, though there is usually a small additional charge. The team at ESE Projects delivered the right solution for us by listening to our needs and working within our time boundaries and budget. ESE project staff were, at all times, extremely helpful and efficient. The installation was completed to a high standard and with minimal disruption to our production processes. Working with the staff at ESE DIRECT gave us total confidence with the product that they supplied, and installation caused us minimal disruption to our ongoing business activities. Just wanted to say thanks for your help on this project. It looks great!